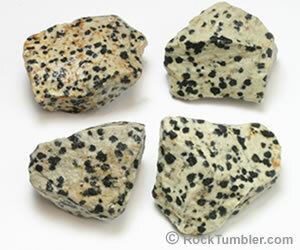 The name "Dalmatian Stone" comes from the appearance of the stone. The black spots on a white background make many people think of the breed of dog that we call a "Dalmatian." Here's what dalmatian stone looks like in the rough. It doesn't break like jasper. It Looks Like a Dog! 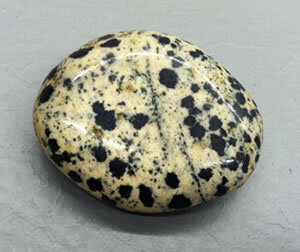 "Dalmatian Stone," also called "Dalmatian Jasper," is a white to cream-colored material with black spots that is produced in Chihuahua, Mexico. It reminds people of the Dalmatian breed of dogs - and that is where it gets its name. Dalmatian Stone is a favorite tumbling rough and cutting material that is very easily polished to a bright luster. It is a familiar semi-precious stone that is cut into beads, spheres, cabochons and carvings. It is also commonly seen as tumbled stones. If you do very much rock tumbling you will probably discover that Dalmatian Stone seems to be much softer than any other jasper that you have tumbled. That made us start to doubt the name "Dalmatian Jasper" that everyone calls this stuff. We would place one to two inch-sized pieces in a tumbler with coarse grit and they would be beautifully rounded in just one week. Jasper is tougher and usually takes more than a week for pieces this size. Want Some Dalmatian Stone Tumbling Rough? We have some nice Dalmatian Stone rough from Chihuahua, Mexico that is suitable for rock tumbling, cabochon cutting, and other lapidary projects. Get a bag of Dalmatian Stone. Dalmatian Stone readily accepts dyes and it is often sold as artificially colored stones. This photo shows (clockwise starting at top right), natural color, dyed red, dyed green and dyed purple. Dalmatian Stone readily accepts dye. 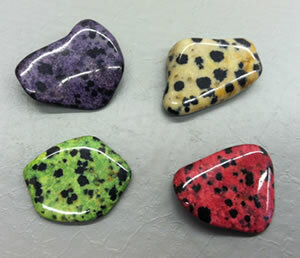 Dyed Dalmatian Stone beads and tumbled stones are commonly seen at rock shops, at gem shows and in bead catalogs. When it is dyed outrageous colors like what is shown in the accompanying photo it sells rapidly. The white background of Dalmatian Stone is easily penetrated by the dye to produce vividly colored stones. This allows bead and tumbled stone manufacturers to start with a common, inexpensive, and easily-worked material and transform it into a lustrous, brightly-colored material with a much higher sales appeal. We thought that Dalmatian Stone looked more like an igneous rock than a jasper. That would be consistent with many peoples' idea that the black spots are schorl tourmaline - but we didn't agree with that either. In an attempt to answer our question we consulted mineralogy, petrology and gemology books in our library; searched Google many times; and, wrote to a few people who sell Dalmatian Stone or work with it. However, we did not find an answer that satisfied us. 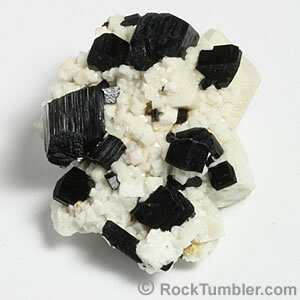 A mineral specimen from Malawi that presents arfvedsonite on a base of feldspar. Coaresly crystalline Dalmatian Stone might look something like this. We decided to send a few pieces to John Attard for x-ray diffraction, a laboratory analysis that identifies minerals and other materials with a crystalline structure. He crushed the specimens and determined that the black material was very slightly magnetic. He used that to isolate some of the black material from the light matrix. John's analysis determined that the black material is the mineral arfvedsonite, an amphibole similar to hornblende, with a composition of Na3(Fe,Mg)4FeSi8O22(F,OH)2. Jasper is a microcrystalline variety of quartz but the composition of our Dalmatian Stone is much more interesting. It is a mixture of minerals and therefore it is a rock. The types of minerals in the rock are those that crystallize from a melt. So, instead of being a jasper, Dalmatian Stone is an igneous rock. You Say You Are Skeptical? A few people have contacted us about what we have written above. They don't like giving up the word "jasper" for this material or they insist that the black material is schorl tourmaline. If you are struggling with the identity of this material, here is what we encourage you to do. Get in touch with Mr. Attard or another person who does x-ray diffraction and make arrangements to have x-ray diffraction done on specimens that you provide. This will cost you a few bucks. We paid for two XRD analyses to confirm our ideas about this material. You can pay to confirm it for samples that you provide. The analysis will probably cost you about as much as a small rotary tumbler. Let us know what you find out.